Extenders, also called tele converters, are devices which magnify the center part of what lens is seeing and therefore they multiply the focal length. When center part of lens is multiplied some light is also lost and therefore 1.4x extender makes lens one stop dimmer and 2.0x extender makes lens 2 stop dimmer. Example: Lens which focal length is 200mm and maximum aperture is f/2.8 is used with 1.4x extender it becomes 200mm x 1.4 = 280mm and the maximum aperture is one stop dimmer, which in this case is f/4 lens. Performance depends also which lens is used. With Canon superteles (e.g. Canon EF300mm f/2.8L IS USM) there is no significant image quality drop when if shoot one aperture stop down. However performance will drop with shorter lenses (e.g. 130L and 200L) and with 70-200mm zooms the quality drop is even bigger. There are no adjustments etc. in the extender itself. Therefore only aspect I can thing of handling point of view is the slower focusing speed and worse focus accuracy. However superteles work pretty well but for example with Canon EF200mm f/2.8L II USM and Canon EF135mm f/2L USM are no longer usable with fast action sports e.g. enduro racing. On usage point of view there ain't nothing special what user has to take into account, even EXIF information has correct aperture and focal length. Generally all telephoto primes longer than 135mm, except soft focus 135mm, are compatible. From zoom lenses 70-200 and longer lenses are compatible, at least physically, you may loose autofocus with non-professional cameras. Also TS-E lenses are compatible even Canon doesn't mention it. Performance depends also which lens is used. With Canon superteles with f/2.0 or f/2.8 maximum aperture (e.g. Canon EF300mm f/2.8L IS USM) quality drop can be tolerated if ultimate sharpness and contrast is not needed. For landscapes 300/2.8L can be used with very good image quality between f/9 and f/11, balancing between diffraction and optimum aperture. Image quality with shorter tele lenses and zooms is pretty bad and in most cases using 1.4x instead with "digital zoom" in digital darkroom gives better results. However 2.0x is pretty usable with Canon EF180mm f/3.5 L USM, on image quality point of view. However it won't autofocus but it ain't so important in macro photography. Diffraction naturally becomes limitation since with 2.0x 180L has maximum aperture of f/7.1, which effectively goes even smaller when focused very close. Therefore usage is limited to f/10-f/13 before diffraction hits. There are no adjustments etc. in the extender itself. Therefore only aspect I can thing of handling point of view is the slower focusing speed and worse focus accuracy. Superteles still do work to some extend, but action sports is pretty much out of the question. Shorter teles and zooms have really bad autofocus performance, in terms of speed and accuracy. On usage point of view there ain't nothing special what user has to take into account, even EXIF information has correct aperture and focal length. With 2.0x the focal length becomes so long with most of the lenses that tripod better be very stable and lens should be attached from lens collar to tripod by balancing center of gravity to rotation axle by sliding quick release plate to correct placement. Optical performance is slightly worse than with Canon 2.0x mkII. There isn't anything specific regarding handling. It attaches to lenses and cameras as well as you could thing. There are no adjustments etc. Usage is as with any other extender except that this extender will not show true aperture on the camera's displays or in the EXIF data. Focusing performance is naturally much worse than without extender. 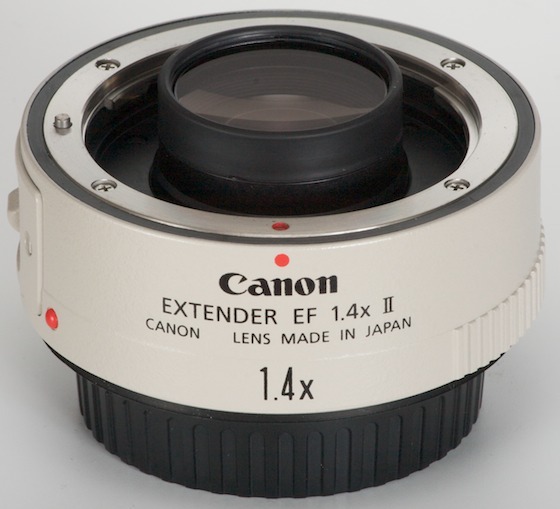 This extender does not have any protruding parts so it's compatibel with all Canon EOS lenses. However take into account the limitations to autofocus. 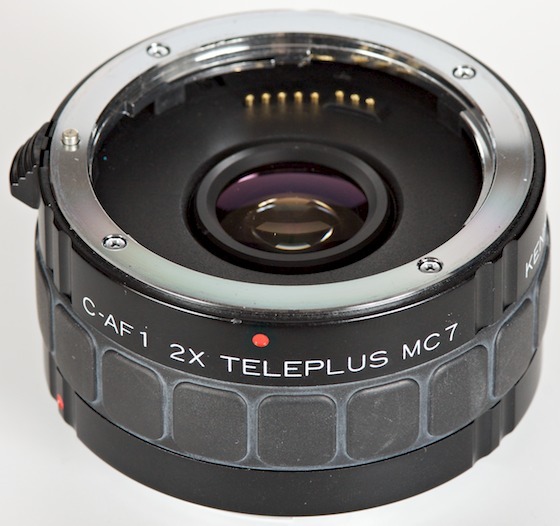 As you can see from photo there is lens group which protrudes inside the tele lens the extender is attached to. On Kenko extender there are no protruding parts and physically compatible with all Canon EF lenses.